If you’re looking for a way to quickly transform your flower beds, you’ve got to see this hack! 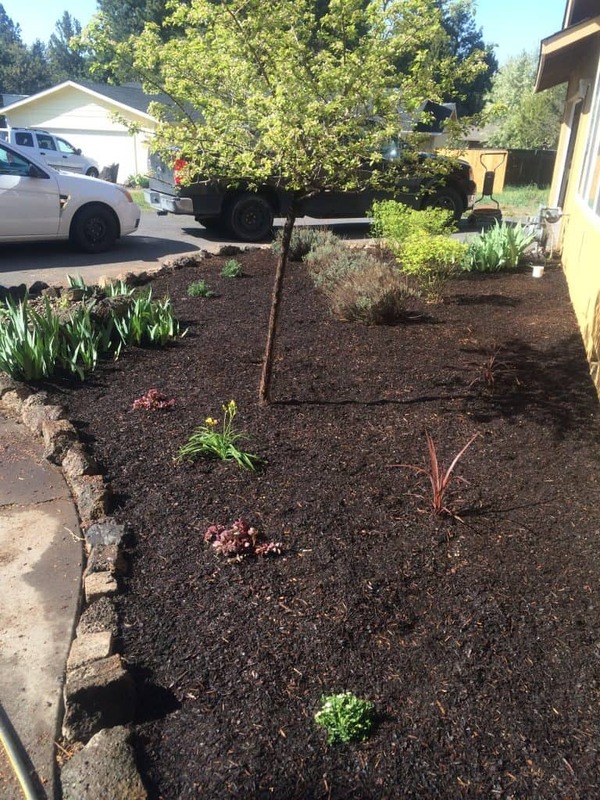 We did a flower bed transformation by adding dark mulch. You’re going to be shocked at the dramatic landscaping transformation. 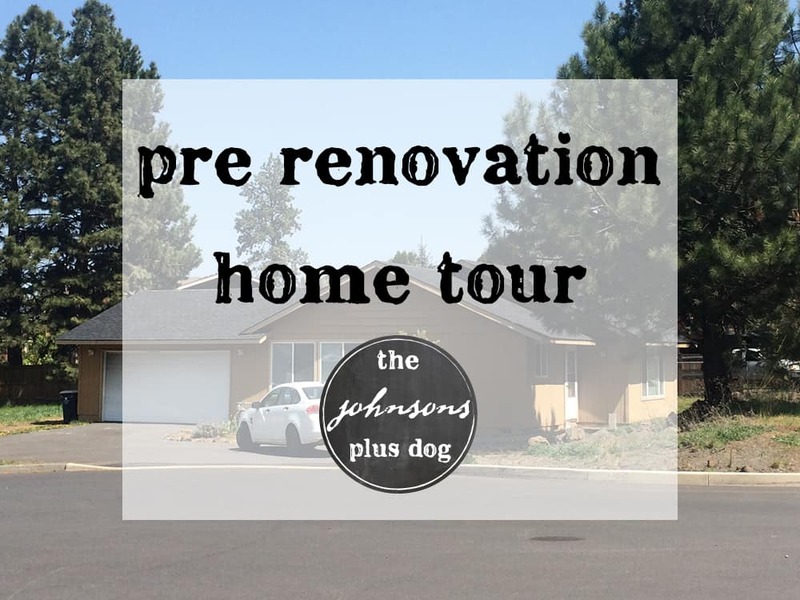 As you guys know, we’ve been in our fixer upper for since April and moving slowly through some major renovation projects on the interior (see a full tour of the house pre-renovation here). 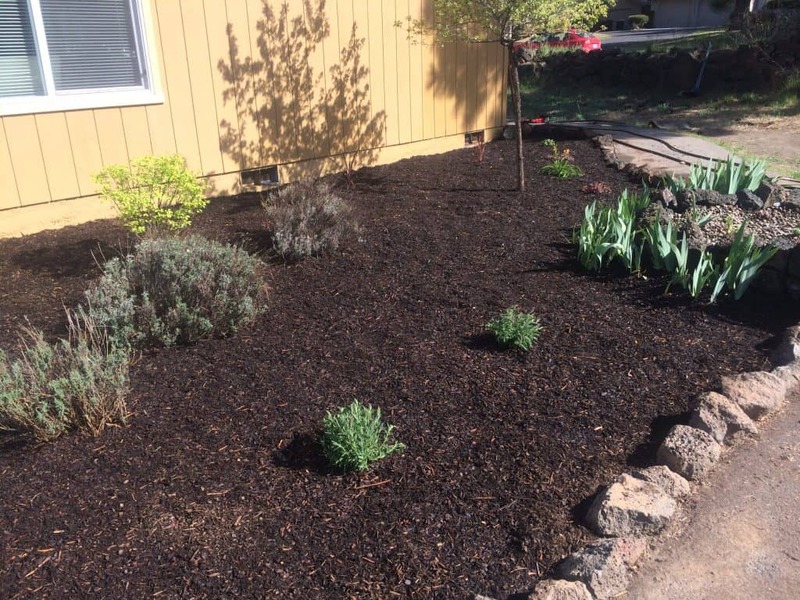 Last week I talked about some ideas for high desert landscaping and today I’m going to share with you one of the first things we did on the house and tell you why I call it our “Dark Mulch Miracle”. 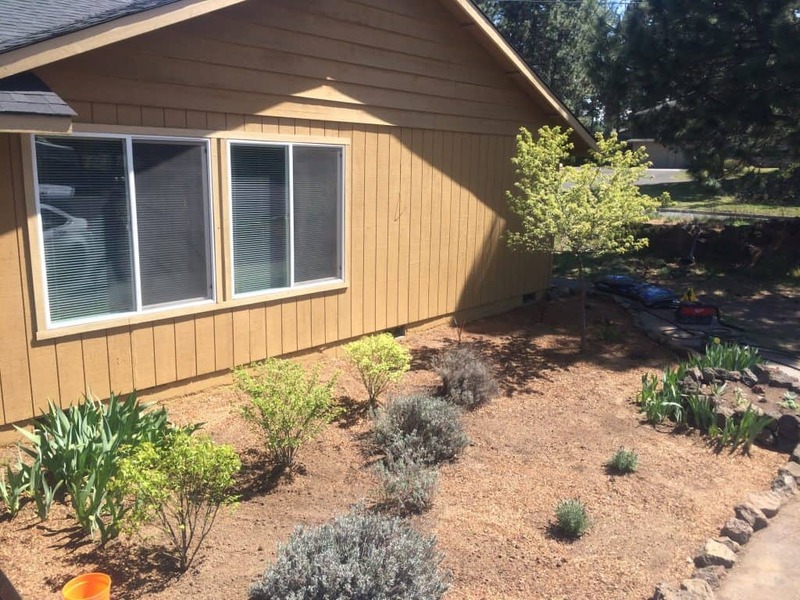 This flower bed transformation post contains affiliate links, but nothing that I wouldn’t wholeheartedly recommend anyway! Read my entire disclosure here. It had only been a few weeks since we moved, boxes were everywhere, we had loads to do on the interior (still do) but we felt like we HAD to take a weekend and work on the front yard. We were the obvious black sheep on our little cul-de-sac. Of course, we didn’t have a fence so the whole world could see this wonderful field of weeds. There was trash all around the house we had spent time cleaning up, but it still looked just horrible. 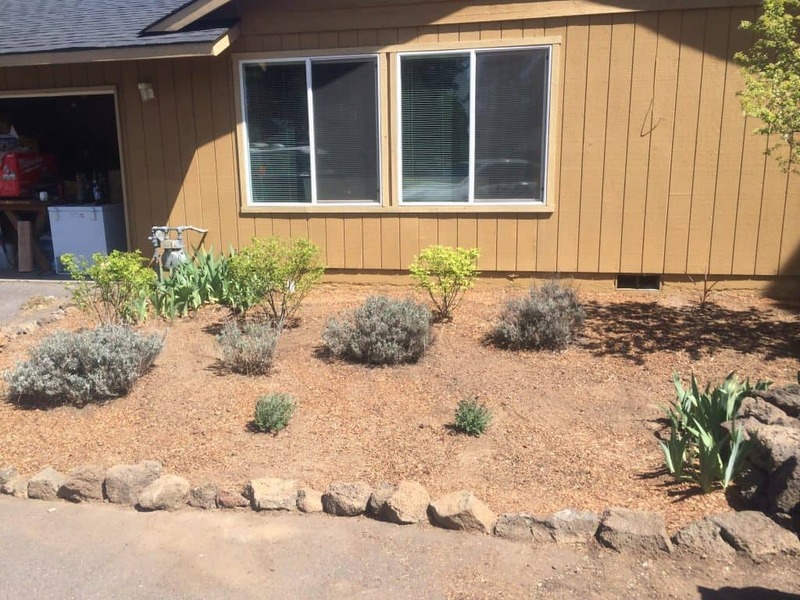 So we took a much needed break from the inside and set our sights on trying to make this front flower bed look more presentable. 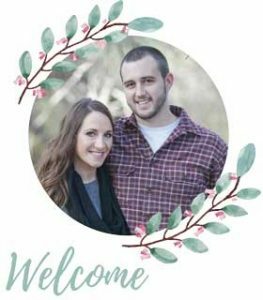 We just wanted to spruce it up a bit without pouring tons of the time and money into it. We were looking to do a flower bed transformation. Now you know what we were dealing with. As if a backyard full of weeds wasn’t enough, we got lucky and had more weeds to deal with in the front yard. You can see in that last picture that our little “Plus Dog” Gannon decided to sneak out the garage door to see what was happening. Now this was pretty much the only landscaped part of the entire lot and it’s not even pretty. The plants were planted in weird spots that didn’t look right. So we took a trip over to Home Depot and got some goods. 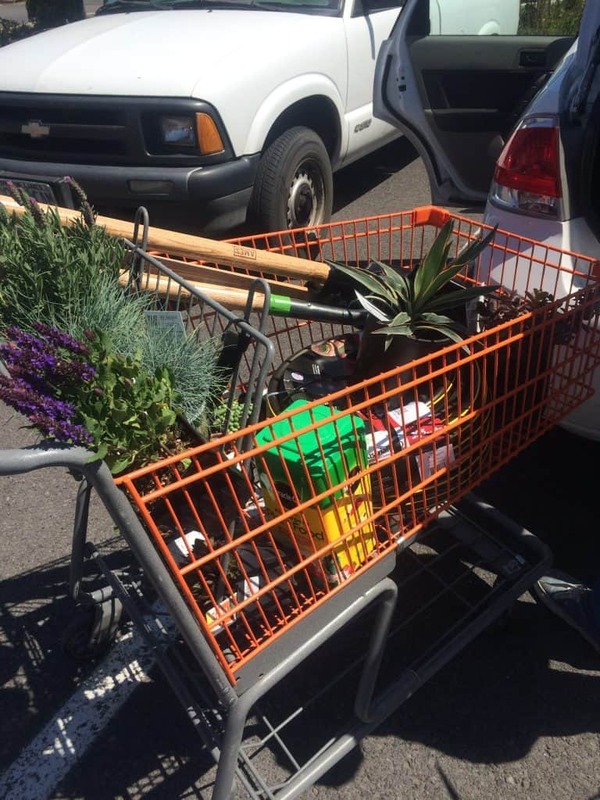 Lots of fun new plants, some succulents, some tools (can you believe we didn’t even have a shovel?) and TONS of black mulch. We used this mulch (< affiliate link, keepin’ it real) At the store I was drawn to it because I just thought it looked cool. 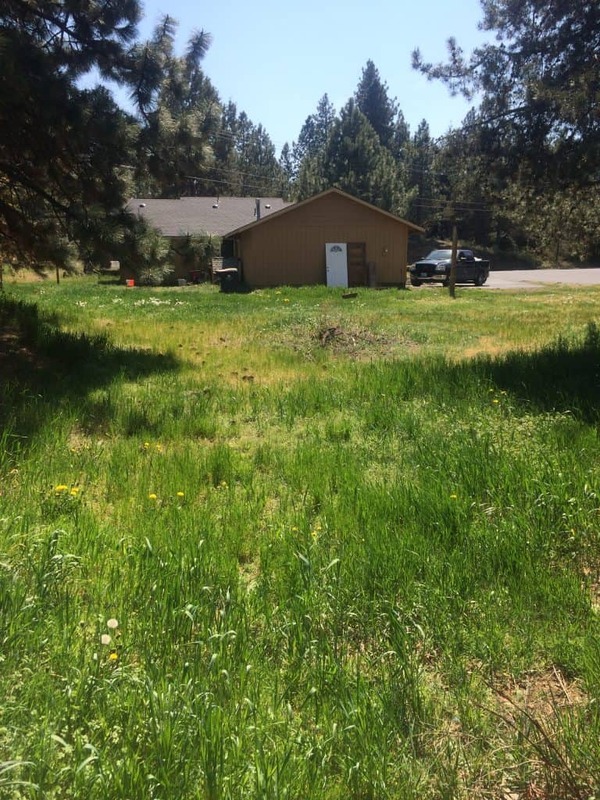 I had seen it used in some of the newer neighborhoods around Bend and thought it looked good. 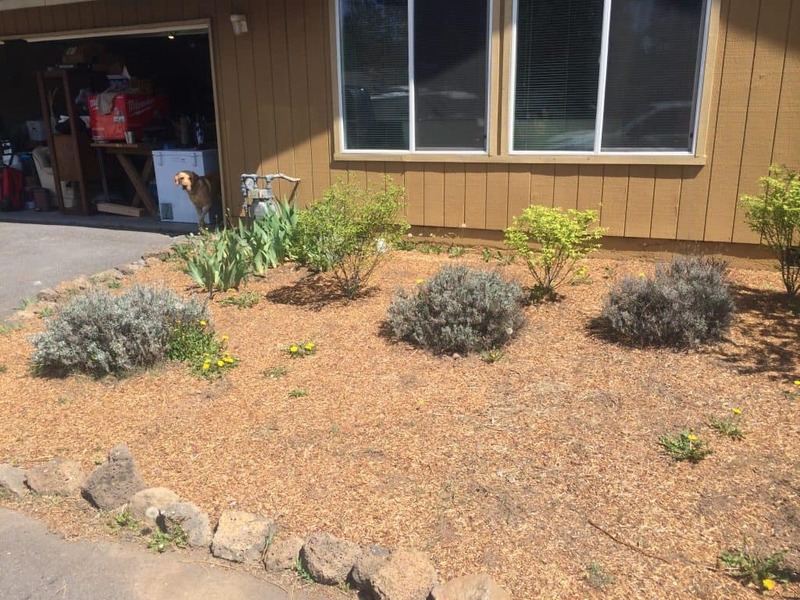 We started with removing all the weeds… now that was fun. After hours of that, we started planning out where the plants would go, knowing that some of the plants that were there were going to need to be moved or removed completely. 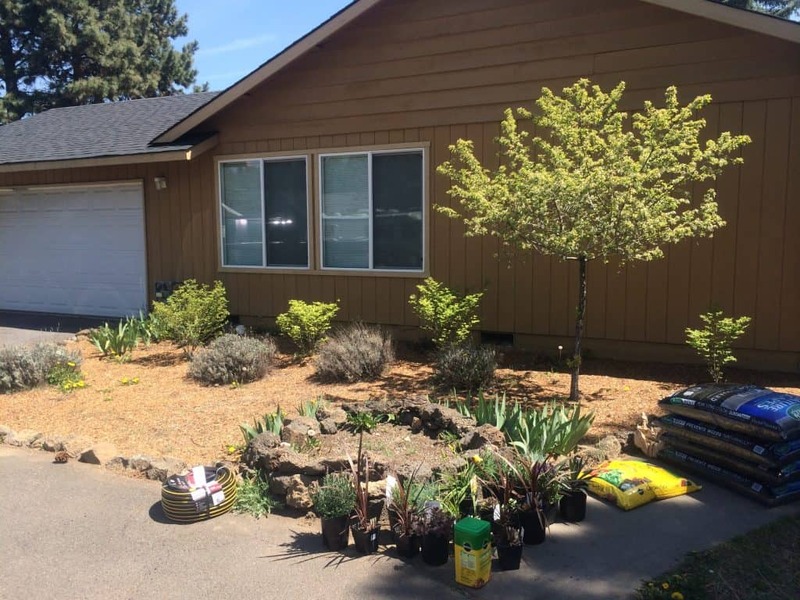 This is what it looked like after we moved plants and planted all the new ones. Those two new little guys in the front of the planter are lavender. We planted some cordyline in the back behind the tree. Over near the walkway we planted a day lily, 2 stonecrop sunsparkler cherry tart, and 1 sandwort ground cover Those ones are in the shade in this photo so you can’t see them until a later photo. The existing plants were (starting from the back and working your way to the front of the bed): Iris bulbs (Logan’s not a huge fan of these so we may end up ripping them up and giving them to someone else transplant eventually), 3 Burning Bushes, 4 established lavender plants (they don’t look like much here but these were oh so pretty this summer and I didn’t even think to snap some photos so have to wait til next year!) and a tree (still have NO idea what kind of tree this is, if you know please let me know!). It looked better, but not quite great. At this point we had all three sets of neighbors come over to either thank us for finally getting rid of some weeds or offer us their advice. 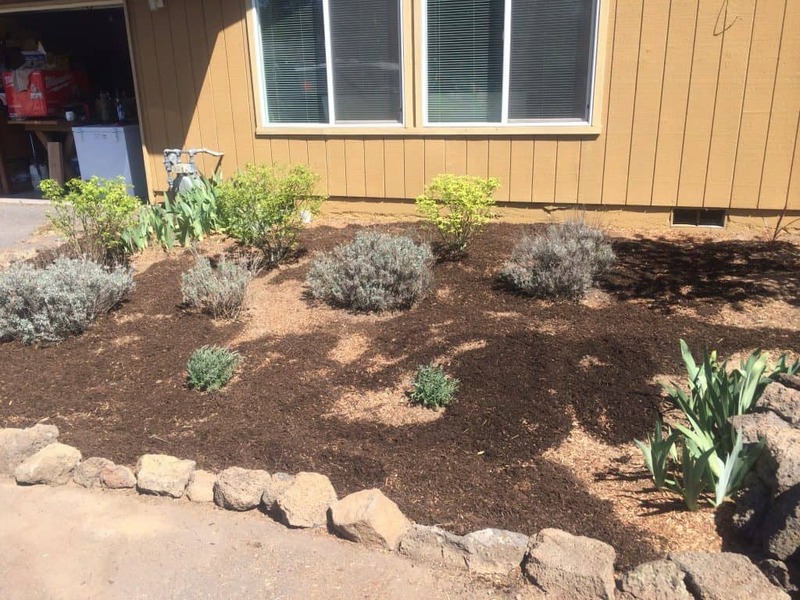 The next day we woke up and started spreading the dark mulch and I was honestly SHOCKED with how the flower bed started transforming before our eyes. We went through 6 bags… we had to go back to the store for more because we started with only 4. Wow, what a shock, right? 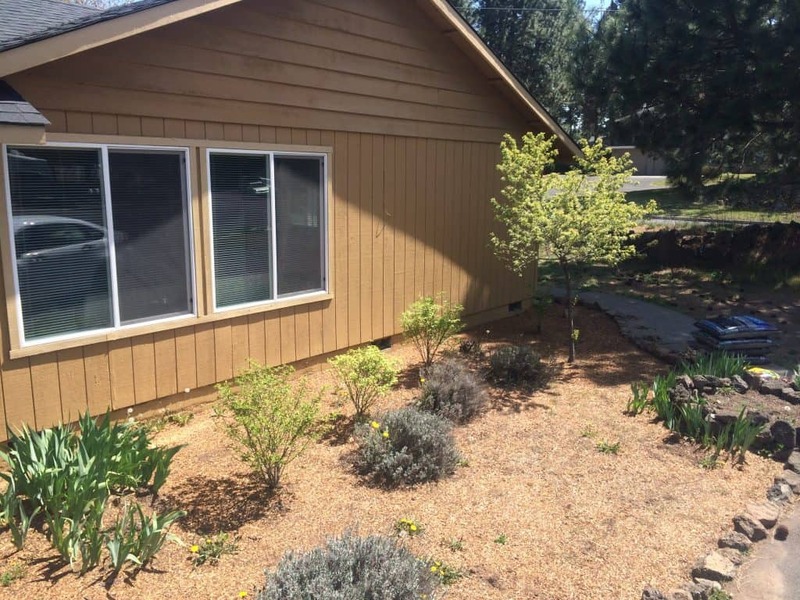 The dark mulch did WONDERS on making the space look refreshed and upgraded. I think it really makes the plants “pop”, don’t you? I’m so sold on dark mulch that it will be all we are using in the future. 5 months later, this garden bed still looks great. We’re approaching the end of our season (it’s getting down to 36 degrees at night here, say WHAT?!) so not much sure how much longer it will stay looking as pretty but, I sure have enjoyed it so far this year. Can’t wait until next year and we make more progress on the rest of our lot. 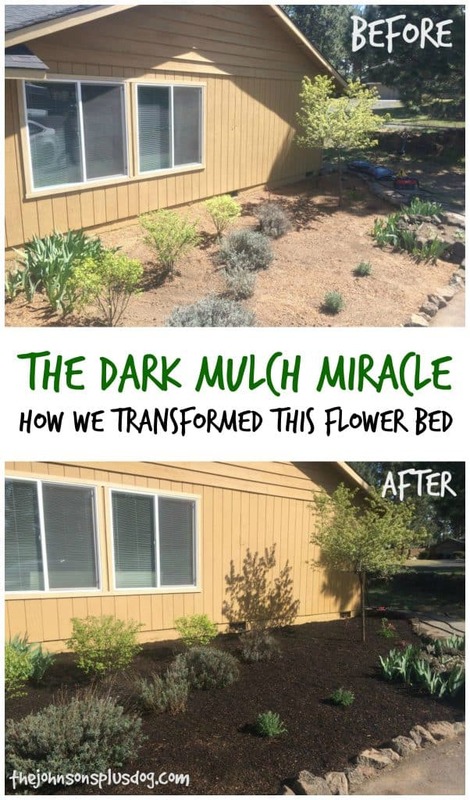 What do you think about this flower bed transformation? You see that little round planter on the right? I’ll be sharing all about how I turned this into a cute little succulent bed next week. UPDATE: Check out how to plant succulents here. Hi, Chelsea ~ I can’t believe what a difference that dark mulch made! And you’re right-it did make your plants pop. Plus, it looks great against the color of your house. Thanks for sharing with us at the Merry Monday Link Party and good luck with the rest of your projects! Thanks for stopping by Tiffany ! love how perfect it turned out. I can’t wait to buy a house. Thanks for stopping by Jasmine. Ya having a house to do what you want with sure is fun, but it does come with a lot of work too! Have a good day! Great job on that front bed! Maintaining a yard is a ton of work! I love the black mulch! One of the guys in the local gardening facebook group posted photos of his beds with black mulch, and compared to some of his beds with red mulch? It was AMAZING. I told my husband that when we got ready to mulch, we would be using black mulch. Our problem will be that we need so much of it. A friend of ours had 2 pallets delivered to her house and could have used about 2 more pallets. She told us that she spends about $1000 every 2 years on just mulch. Ugh. We moved into a house in June that had been neglected for a couple of years. We have 1.5 acres that need attention. We’ve started some of the work, but it’s just too hot here on the Coast to do much. With cooler temperatures, we will be prepping and planning for the work that will get done in the spring. Ya I love the big difference black mulch makes. Good luck with your prepping!! Thanks Jamie ! We were shocked what a difference the dark mulch made! The dark mulch does look amazing. Did you notice if it seemed to radiate any heat. That would be my only concern about using it here in scorching Southern California. We got up to the hundreds here and I didn’t notice it. But it is in our front yard so we don’t really hang out around it! Thanks for stopping by. Great transformation 🙂 Really makes a huge difference !! It’s fun to be co-hosting #HomeMattersParty with you . It looks great. I bet you’re loving it now! Glad to be co-hosting the #HomeMattersParty with you! Wow! That looks amazing. It totally transformed the whole look of it. So happy to be co-hosting #HomeMattersParty this month with you! Your flower bed turned out great! It looks like the plants will grow in nicely in the years to come. And I really like a dark coloured mulch in a flower garden. I am planning to put it on my property in the next couple of years. Happy to be cohosting with you at #HomeMattersParty. Wow! That is a miracle. I should try it out on our flower beds. I am so not an outdoor gardener so I rely on people like you for creative ideas. Thanks so much for this one. I love it! Looks great! 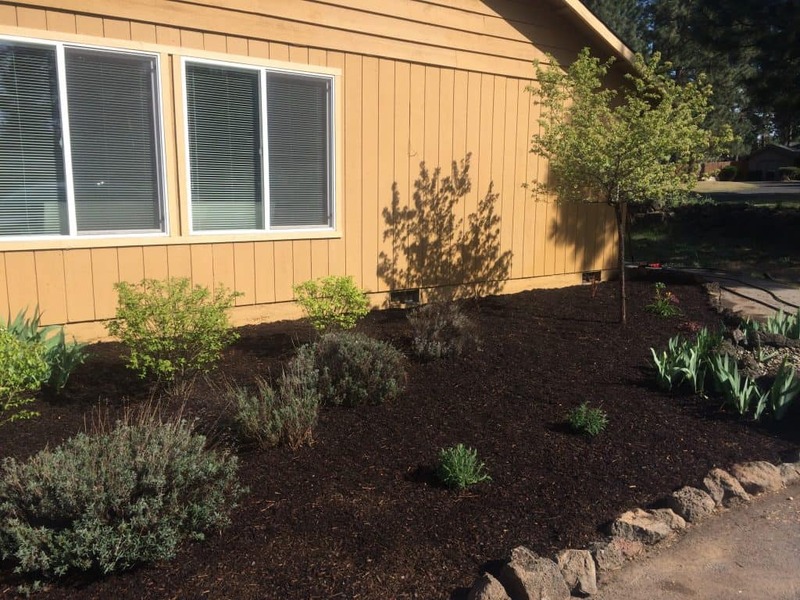 I love dark mulch and am always so happy with how polished it makes everything look. It’s been a another great #HomeMattersParty weekend co-hosting with you!